LONDON--(BUSINESS WIRE)--A well-known market intelligence company, Infiniti Research, has announced the completion of their latest article on the strategies for better reverse logistics management. Reverse logistics management is a multilayerd and complex process that possesses several challenges such as tracking routing status and warranty, analyzing target markets, handling suppliers and contractors, and driving efficiency in repair processes for manufacturers and retailers. This is making market size analysis for any reverse logistics process even more complicated and compelling companies to enhance their reverse logistics management to save themselves from potential losses caused by reverse logistics. Inaccurate target market size analysis results in the failure of reverse logistics management and increases resource investment levels and distribution costs for retail companies. Therefore, improving customer satisfaction has become a competitive necessity for manufacturers and retailers. Companies need to identify the target market size according to demographics and psychographics to understand if the product features matches with the potential needs that exists within the mind of the targeted consumer. They also need to know how the target market perceives a product to avoid more returns. Inaccurate target market size analysis increases resource investment levels and distribution costs for ecommerce companies. To know how an efficient reverse logistics management can address such issues, Get in touch with our experts! With the increasing number of returns, companies need to find ways to reduce these returns without negatively impacting their marketspace. They are required to adopt better measures to reduce the abuse of generous return policies by blocking the account of customers without any warning who have returned too many items. Moreover, necessary steps need to be taken by both retailers and manufacturers to empower customer service associates to make returns more efficient. Vendor agreements are a major issue between manufacturers and retailers and often results in price disputes. This leads to the re-evaluation of return policies many times. The situation becomes critical for products like furniture and electronic items. Therefore, companies need to improve the collaboration between suppliers and retailers to enhance return management and reverse logistics management. Unsatisfied customer services are leading to heavy revenue losses for businesses. Request a free proposal and know how our experts can help you analyze customer behavior and optimize your reverse logistics process. Manufacturers and retailers need to analyze the market size and implement new technologies to improve the reverse logistics process. They can leverage the services of third-party partners to sort, resell, process or dispose of items that will reduce the cost of return processes. They can even use sensors, IoT, and connectivity to monitor, troubleshoot or repair products in the field and minimize the need for consumers to send products back. Options such as easy-to-replace components and hardware that can be sent to consumers for self-repair, connected products with software and operating systems that can be trouble shooted or updated from anywhere can also be implemented to better the reverse logistics process. Moreover, manufacturers and retailers can use data to track the condition of the products, the volume of returns, and the reason for return along with the percentage of sales to enhance reverse logistics management. Wondering how the latest technologies can improve the reverse logistics process for your organization and decrease the number of returns? Request more information. 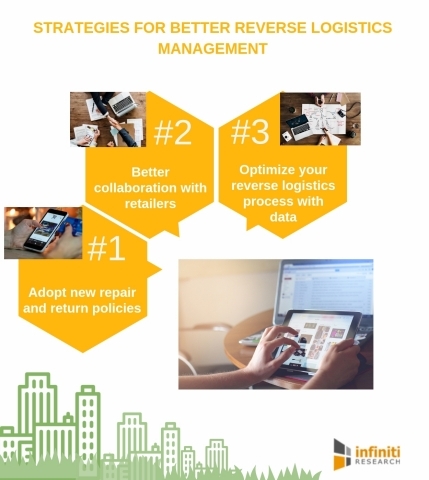 Infiniti Research has announced the completion of their latest article on the strategies for better reverse logistics management.